Its an excuse, but screw it, if it were any other day but the day before Labor Day, It would have been a nice morning. Don't complain, as long as you stayed whole during it. There is a LOT of year left in the tank. I woke up early today to have some blood work done, and I figured that was a good enough reason not to do a video last night, in case there were any overnight events that moved us ahead of the 10AM speech by Ben Bernanke at the Jackson Hole symposium. 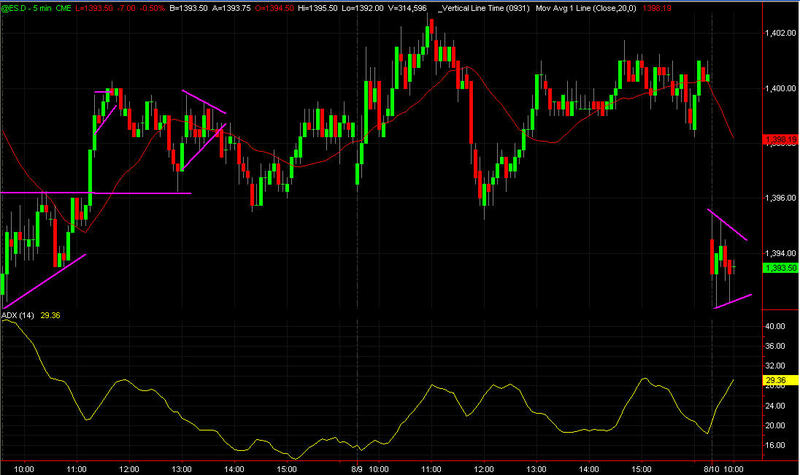 I had been looking for buying ahead of the meeting, but expected it yesterday, which never materialized. 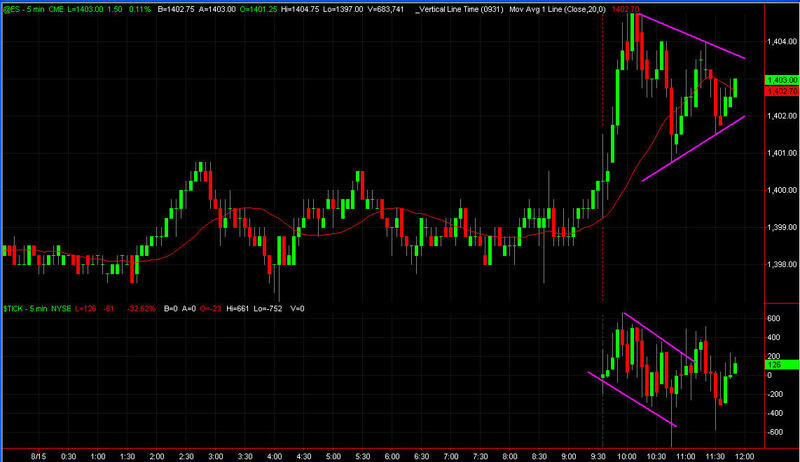 After the way we sold off the last 30 minutes I was watching for a nice gap down to the 1390s (basis the S&P Futures) for a buying op, but instead we gaped up pretty nicely today as there was buying in the Euro as well as the index futures in the early morning. I tried a short, but scratched it, and now I'm now waiting for 10AM to see how the market reacts to whatever comes out of Bernanke's mouth. My plan for the day is to stay small, because the one thing I hate most is digging a hole on a day that there will likely not be an opportunity to get out of. Remember, risk first. Sign up for FREE to http://stockmarkettrendsx.com and get on my list to receive the Market Autopsy video this wekend. This is ABSOLUTELY influenced by my opinion that we bounce today at some point. Right now, we are correcting the push lower from this morning. A scenario could be a stall out a little bit higher (maybe just under/over 1400) and then a retest drift of/towards the lows. 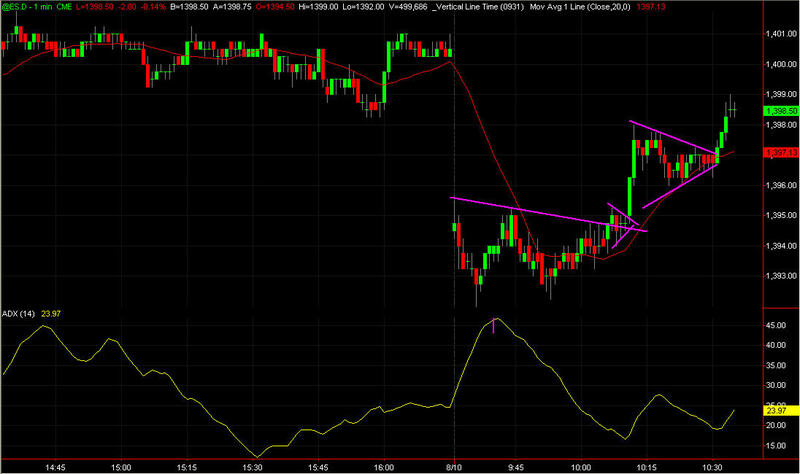 From there, we could see profit taking and a push higher in the afternoon. A change in the breadth (which is currently stinky) and a good pattern to back it up would go along way in building my confidence. Again, it's an opinion influenced sceanrio, but one that can be considered if you share the same view as mine. 60 minute, all sessions. 2 fake outs and then the move. I've been saying over the past few days that I expect the market to bounce into Bernanke's Jackson Hole speech, which is scheduled for 10AM Friday. Starting a few weeks back, I've had a good opinion that QE3 would not be announced and that it could be a letdown. I would love to tout myself as an expert in the economy, but the opinion was crafted based on input from some the writers that I read every week, and who's opinion I value. of course, the end result remains to be seen, but not for too much longer. It's a holiday week and there is finally a little excitement (which is what usually happens on the downside) as the market has decided to gap down and continue lower, although not at any neck breaking pace (yet). But the scope of how far and deep is the question. At this point, I don't think we get an all out sell-off, but it's certainly possible. What I think is MORE probable is that the speech is taken as a disappointment, but it may not be on all levels. While Big Ben may not put QE3 to work, he could extend Operation Twist, as well as speak in a manner that breeds confidence that he is ready and willing to ease if need be. There are more and more people coming onto the no QE3 side, which may dampen the disappointment in the end, and have us limp into the long weekend instead. In the end, you will get a lot of super gurus that will say "as called" or some other nonsense, when all they called is 6 different opinions, so they couldn't be wrong if they wanted to (which they 90% are). See, their broken clocks are only right twice a week, not twice a day. I still think we try to bounce today at some point, but I'm not confident enough to guess at where, or firm enough in the opinion to hold overnight. I'll be watching for a buying op off the opening push here to/below the overnight lows. If we don;t get a bounce I'll likely head to the sidelines but be watching for a boucne later on. As I finish this we are retesting 1400, let's see if it can hold on the short term. I still think we test up to the highs at a minimum and we did get some responsive buying this AM, which is Bullish, but yesterdays highs need to be challenged to keep the Bull happy. Is AAPL really a Super Guru? Is $AAPL really a super guru in disguise? They have almsot as many lawsuits as the bad breathed scam artists do! There is absolutely NOTHING I love more than when a super guru exhibits his desperation to keep his harem of random nannies and his extravagant sushi meals well funded by lying about their performance and touting a general direction opinion as an unbelievable play. If you look at the public track record, they STINK! Everything they hype up and give is just a front running ploy and winds up cracking anyone that follows them. One out of dozens that lose actually goes in the direction that they say and they think they are killing it? Pu lease! DO NOT GIVE THESE CRIMINALS A DOLLAR OF YOUR MONEY. No matter how much they beg and plead for you to read their super terrific (which is really just robbery) deals on their super-hyped garbage classes, seminars and rooms, don't fall for it. If you have any questions, or need assistance, contact me at tinymjs at gmail dot com and I will do my best to help. I've already helped some people get back some fo the money that was scammed from them, and I'll do my best to help you too. I can't get the video to record so heres what I'm looking at for Friday. 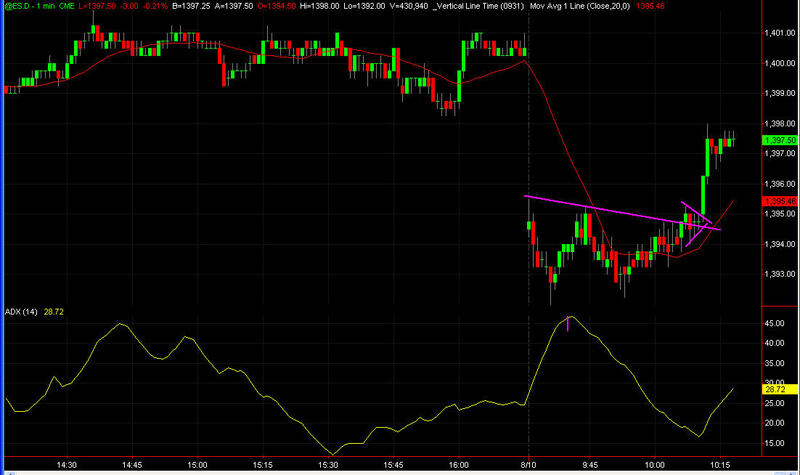 We finished off near the lows of the session, after a gap down could not fade. We are in the mdist of a pullback form highs, but are approaching support. 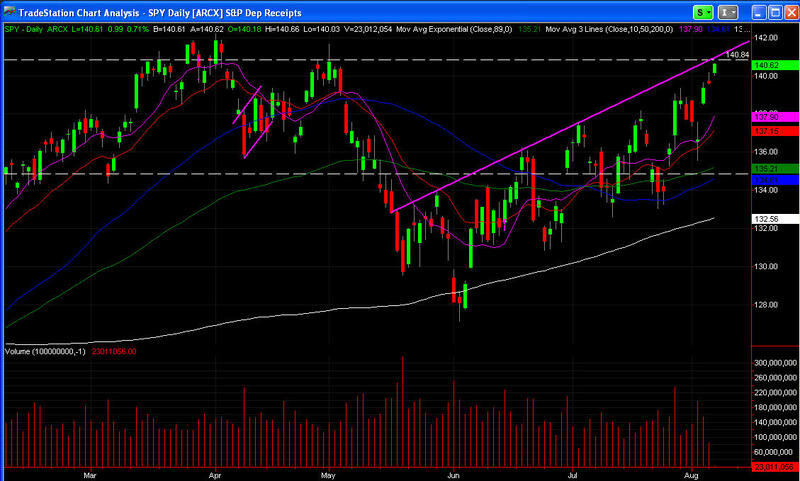 Watch the 20 EMA on the daily SPY chart, and then 139.25, which fills a lap from early in the month. For Friday, I'll be watching any early upside for a shorting opportunity (like Thursday that never happened) for a test back down to the lows from Thursday, but a further push or a gap down will be watched for a buying opportunity, as long as there is support and a pattern to lean against. Have a great weekend and don't forget to sign up to the list at http://stockmarkettrendsx.com to get the Market Autopsy video delivered to your inbox this weekend. Those filthbag lying criminal front running super scumbag gurus who called the highs "soon after" the last FOMC meeting really nailed it I guess! They know nothing about the market, or te trend that move it. Stop being sheep! Looks like this gap will qualify to be watched for a fade. Despite being slapped by regulatory agencies, these filth bag, bad breathed freak super gurus still hype up FB. Whoever would call that stock LONG into the lockup period expiration so they can use the pump to sell their shares should be in jail, period. Funny, those that call brokers scumbags and make comments about how they are helping people are doing nothing but robbing the sheep that are following them. If you have been victimized by these crooks, contact the NFA, SEC, FNRA, CFTC, your State Attorney General and the FTC. sicne then, we've seen some rejection, as work gets done adn profits secured. If you watched my video or are a subscriber to my list (it's free, sign up at http://stockmarkettrendsx.com) you heard me talk about today's plan, whcih was to watch for early upsdie for a shoritng opportunity for a test back down to the Tuesday lows. 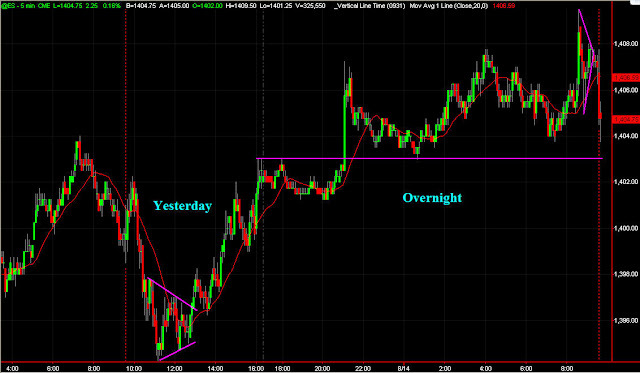 We did test, and even break the lows from Tuesday, but that was in the overnight session. So far today, while the push up early on has pulled in and was faded, we haven't come near today;s lows, nevermind yesterdays. My plan for the afternoon is to watch to see what breaks out of this congestion we are seeing. We had a nice triangle, but the break did not get to the highs, and now the break down from that pattern hasn't led anywhere either. We "should" move this afternoon, as the ADX On the 5 minute chart is now below the 15 mark, but direction is still up in the air, so to speak. The good news is that the triangle that I highlighted in the previous post suggests that the chop, at least for today may be coming to an end sooner than later. The daily chart of the EUR/USD pair looks like its in a bear flag here. 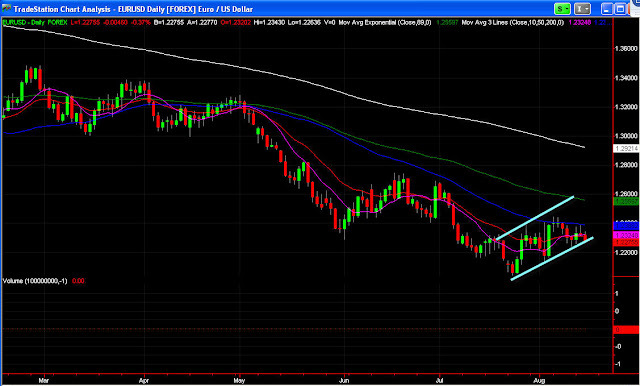 June 2010 lows are 1.1875 and would be the target if this gets confirmed. Small overnight range and a lame gap will keep me on the sidelines for the open. So far, we fell .05 shy of testing the lows from August 9th, but its clsoe enough as thye say. Not on purpose, it just turned out that way! It's pretty amazing to me that someone who was once slamemd for "not having an original thought in his head" by some scumbag front running pump and dumper gets so many appearances. Apparently, those that are in the know tend to disagree with that filthbag. Tune in and see for yourself! We are close to the overnight lows, so I will watch to se eif we test there and pivot off of it. 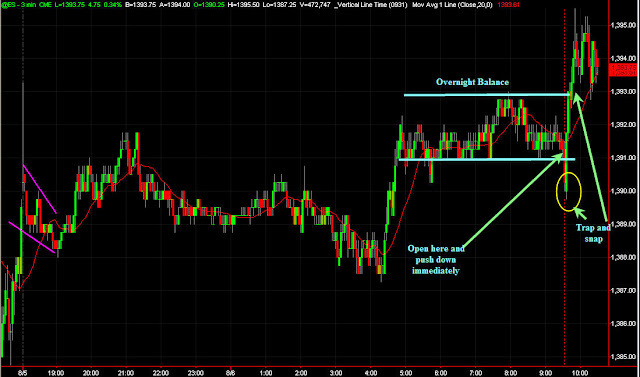 Volume is coming in better as well, as the Bulls are continuing to fight here, trying to stay above 1400 for the close. We have eased off the highs after coming just shy of the May 1st levels, basis the S&P Futures. We stop there and get a bounce back to the highs OR we slow down, build some value and then trade lower, to the open first and then yesterday high volume level at 1394. Breadth is still ok (currently just over +1k), but like yesterday, is easing off it's best levels. This will have change to give the Bulls a shot in the arm. currently, we are at the highs, so a breakout is more likely than a breakdown, but for aggressive Bulls, the question has to be whether it will stick or not. So far, the only shorts that are trapped are the ones that sold the open, the 1400 (basis the S&P Futures) sellers have not been punished yet, but another have the late to the 1400 party buyers. It's another chopperific morning, but as I said in my video last night, I'd rather see a morning consolidation and then an afternoon expansion in volatility. Of course, what I'd rather see is not what happens, sometimes the market doesn't get my memos! Are they going to go to 1400 first or will they fade it off the open? 6 point range on the session, makes last Monday;s 11 pointer seem like a large range day. 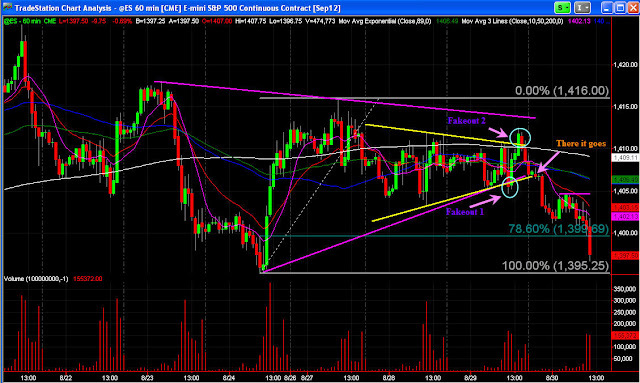 We can't even put in a 10 point range, which is what I tend to look for at the least on a narrow range session. With still 2 hours to go I guess we could break this logjam here and extend the range a bit, but I wouldn't count on it, and as of now, it's just completely brutal. I am going to be on FOX Business' Markets Now close to 1pm est on Monday, hopefully discussing some of the items below. After a string of weak but positive employment reports, Friday's data were "better than expected", but still not strong enough to keep pace with population growth. And when you dive into the details of the report, according to John Williams of Shadow Stats, you see the normal "seasonal adjustments" accounted for a significant number of jobs created. What continues to amaze me is how many "experts" think this recovery is anything other than normal following a financial crisis. As I have said for three years, the economy we are living through right now is what typically happens after a systemic meltdown. It's lukewarm, tepid and any other adjective you want to throw in. If history continues to guide us, the real progress on the jobs front will happen on the other side of the next recession, which I happe n to believe will be mild given the almost $3T in cash on corporate balance sheets and how lean corporate America has become. The markets reacted very favorably to the news on Friday, but Europe and our futures were already in rally mode before the employment report was released. With the disappointing lack of news from our Fed and the ECB and the positive jobs report, the Dow ended last week almost exactly where it began the week. As I mentioned in the last few Street$marts, there are a few key indicators to watch for clues to the next big market move. On the positive side, high yield bonds are making new highs and the semiconductors are trying to step up and lead. But the Dow Jones Transportation index, S&P Mid Cap 400 and Russell 2000 Small Cap need to get into gear for this rally to last much longer. We also need to see less defensive sectors outperform the market. For a while now, it's been consumer staples, utilitie s, REITs and biotech, not your typical healthy bull market leadership. Could the Dow reach up to visit its 2012 peak? Sure. But unless something changes dramatically, I think it will be your typical summer selling opportunity in a presidential election year more than anything else. As always, please feel free to contact me directly at 203.389.3553 or by hitting reply with any questions or comments. We have a small gap up to start the session/week, and it appears it already filled. Initial fade off the overnight highs didn't go very far, and then we walked it back up to the ISM Number. SO far, the release is providing more of a flutter than anything so we'll see if the Bulls want to make it a trend day or not. 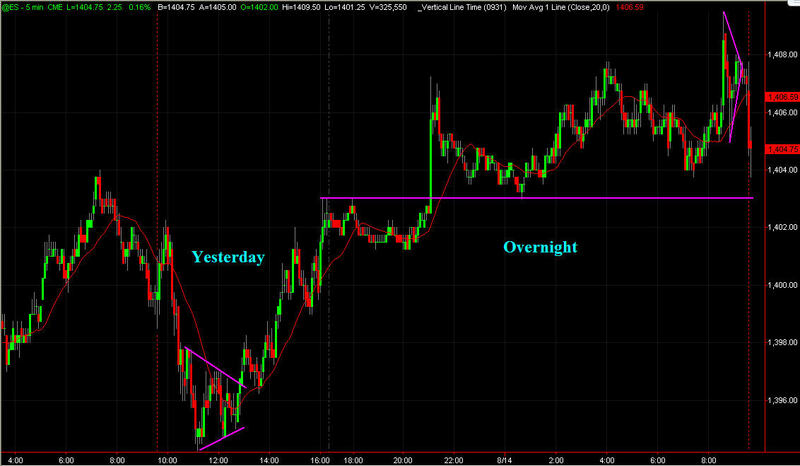 1387.50 is a big number, it's not only Monday's high, but the best level we have seen in a number of months. We could rotate down before that number, to give the super aggressive Bulls fits, but for now, we are holding steady here as we decide where we want to go. If we get the 87.50s, do we double top it there or rip it through and head for the blue skies? 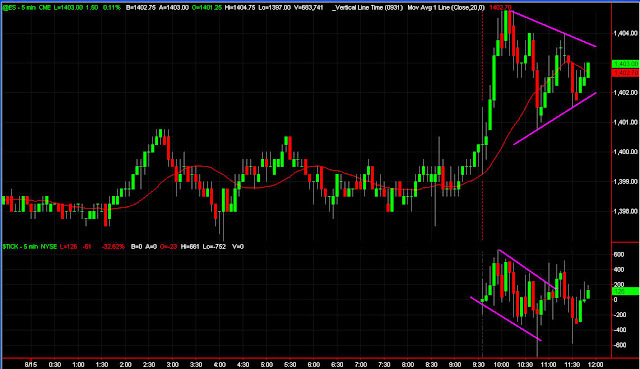 We now have a nice size gap up that I'll be looking to fade it off the right setup and some resistance to lean into. Overnight highs are the first level of interest for me. In my opinion, there will not be a QE3 announcement today. What this does to the market is the big question, and despite what some super gurus may tell you, it's a crap shoot. Reacting to the reaction of the announcement is alwasy the more prudent strategy, so I'll be on the sideliens awaiting movement, if indeed it does happen. I think we should get some sort of movement, but who knows? Remember, we still have the ECB announcement tomorrow and Job Numbers on Friday.